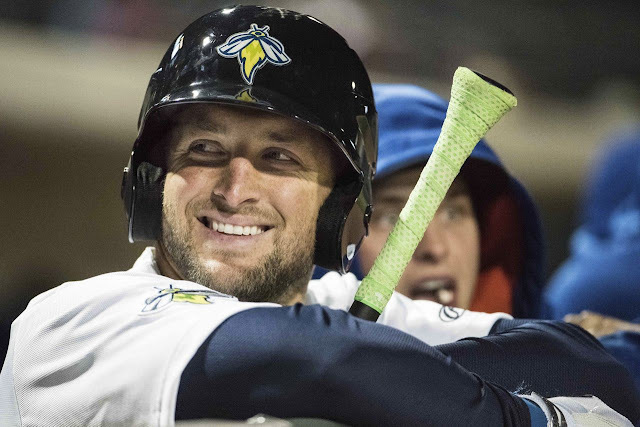 Tim Tebow homered for the second time in three games Sunday as he completed his first series with the New York Mets' Class A affiliate, the Columbia Fireflies. The former NFL and Florida quarterback hit a two-run home run in his first plate appearance Thursday night, then followed that with a three-run shot to right field on Sunday as the Fireflies beat the Augusta GreenJackets 6-0. Tebow, 29, is now one shy of Michael Jordan's home run total with Class AA Birmingham in 1994. The 2007 Heisman Trophy winner was given Saturday off before he returned to the lineup Sunday. He finished the series against the GreenJackets 3-for-13 with five RBIs. He struck out five times and left 13 runners on base. After not getting any chances in his first two starts, Tebow had three putouts in left field on Sunday. The Fireflies, who won all four games against Augusta, continue their opening homestand with a three-game set against the Hickory (North Carolina) Crawdads that begins Monday. News: Tim Tebow homered again Sunday. Context: That made two in his first three professional games for the Columbia Fireflies. Bad joke: For his next act, he will turn water into wine. Caveat: He is 29 years old and playing against kids two-thirds his age in low-A. Pose question: Tim Tebow is a world-class athlete who has devoted the better part of a year to learning to play baseball. He is a monster at 6-foot-3, 255 pounds, and physics dictates that a human being who combines special fast-twitch skills with obscene strength will be able to do things like hit baseballs very far. The question never was whether Tebow would be able to hit for power. It’s: Can he do all the other things that make a baseball player a baseball player? Caveat 2.0: Not yet at least. Offer hope: Around baseball, there are stories of longshots who, through perseverance, opportunity and skill, made careers for themselves. The New York Mets have every reason to want Tebow to succeed. His popularity is legitimate and immense. On the same day Yankees catcher Gary Sanchez, a true franchise player based in New York, went on the disabled list for an unknown period of time, Tebow going yard in a minor league game made for bigger news. Perhaps that’s an indictment on the media, though there’s a strong argument to be made that Tebow, because of his football history and the novelty of his attempt at a baseball career, qualifies as plenty newsworthy. Michael Jordan’s baseball career drew plenty of coverage, and before trying to argue that he was Michael Jordan and this is Tim Tebow, remember: In 2017, Tebow is undoubtedly one of the 10 most recognized athletes in America. Like a bullfighter, pull back red shroud of hope, apply cruel stab of reality: This is the first week of the season, one in which the division leaders in the major leagues include the Twins, Angels, Phillies, Reds, Rockies and Diamondbacks. Tebow’s home runs came off two guys named Domenic Mazza and Jose Morel, neither of whom have been mistaken for prospects. In his 114 professional plate appearances, Tebow has struck out 33 times and managed 10 walks. His swing is a work in progress, his arm fringy, his outfield defense dubious. 1. Tim Tebow does provide, without question, is the opportunity for baseball to get a better sense of the limitations of its talent pool and pave the way for others in better situations than Tebow to see the sport as the potential lifeline it can be. For two decades now, the slow bleed of top-tier athletes away from baseball has eaten away at its talent pool. Most choose football, as football not only presents a better opportunity at playing in college because of its vast scholarship advantages but resonates far more across the country. Baseball says it’s America’s pastime; football knows it is. While Tebow is admittedly a one-man sample, and a poor one at that due to his age, he can provide the Mets with up-close-and-personal knowledge about the struggles of someone not reared at higher levels by the sport trying to transition back into it. Where is the knowledge gap? What is teachable? How best can a team approach a raw athlete and hone tools into skills? If this is nothing more than a one-off – and considering Tebow’s presence always has felt more about marketing than studying him, the chances of that are good – then it would be a blown opportunity by the Mets, who can argue to every football washout that they’re the organization that best understands the unique struggles of switching sports. Better than any sport, baseball is suited for it because of a professional minor league system that caters to a longer development curve. 2. Shohei Otani can pitch and hit at an otherworldly level, surely learning one discipline is possible. Otani was the other non-major leaguer in the news this week, first for a “60 Minutes” interview in which he discussed possibly forgoing hundreds of millions of dollars to pitch in the major leagues next season and then for suffering a leg injury that may sideline him until June. Otani is the 102-mph-pitching, Brobdingnagian-home-run-hitting 22-year-old about whom scouts sing paeans reserved for deities. He plays for the Hokkaido Nippon Ham Fighters and wants to play baseball in the major leagues, but a new rule in MLB’s collective-bargaining agreement limits the amount of money a team can spend on international free agents Otani’s age – and thus could turn a $200 million payday into a maximum of barely $10 million. This rule is profoundly stupid. It does not just cut off baseball’s nose to spite its face; it goes full Ned Stark. Otani is not the star baseball wants. He’s the star the sport needs. And even if he’ll wind up strictly a pitcher – and, despite Otani’s wishes, he will, eventually, because teams froth over his pitching while merely appreciating his skills with a bat – the knowledge of both skills immediately would make him the most interesting player in baseball. 3. Yasiel Puig and the interesting amalgamation of skills and style. Puig wasn’t different than anyone baseball ever had seen. He just felt like a supercharged version of the do-anything ubertalent that shows up every few years – a worth-the-price-of-admission player in a sport that wishes it could have more. Then Puig got a little too hefty, pissed off too many teammates, struggled at the plate and, to the Los Angeles Dodgers, became too big of a headache for them to keep around in the major leagues. To see Puig now is something altogether different. Not just because he lost weight but because he’s doing Puig things again, like hitting home runs. The first week of the season saw him hammer three. Just as promising, he walked more (five) than he struck out (four). And while that won’t hold, he bought himself an everyday spot in the Dodgers’ lineup, which even as of a few weeks ago was far from a foregone conclusion. 4. George Springer, whose makeup is every bit as unimpeachable as his talent. And of all the players with delightful first-week numbers, Springer may be the likeliest to take the leap to superstardom this season. Here’s what he’s got going for him: Springer is 27, that magical age of baseball delight. He consistently walks in more than 11 percent of his plate appearances and has seen his strikeout rate drop from 33 percent as a rookie to 23.9 percent last season. When he does make contact, he hits the ball hard. And while just about the same things could’ve been said about him going into last season – aside from the age – it’s rarely a bad bet to double down on someone with the skills and tools of Springer. 5. Nomar Mazara, who after a delightful first two months last season as a rookie spent the final 3½ plunging deep into the crapper. Over his last 91 games, Mazara hit .227/.286/.370. The Texas Rangers kept him in the lineup because injuries limited their options and they didn’t want to upset a team romping toward the AL West title, but across baseball, people noticed Mazara’s struggles. Broadcast legend Jim Brockmire (Hank Azaria) sat down in the Yahoo Studios with Mets ace pitcher Noah Syndergaard for a must see interview. Still just 21, Mazara spent the season’s first week reminding those who gave him a pass why they did. His 1.212 OPS is fifth in the AL – behind Miguel Sano, James McCann, Avisail Garcia and Khris Davis, naturally – and the beauty of Mazara’s languid left-handed swing is something to behold. 6. J.T. Realmuto means as much as he does to the Miami Marlins. Though at 26 he’s wizened next to the Rangers’ triumvirate, he may be better than any of them today and is wedging himself in the catching group behind Buster Posey, whose stranglehold on best-in-the-game status shows no sign of abating. Like Posey, Realmuto is a converted infielder, drafted in 2010 after playing shortstop at his Oklahoma high school and moved immediately to catcher. Scouts saw his body filling out into the stout catcher-type, and it did, as he packs 210 pounds on his 6-foot-1 frame. Realmuto hit .303 last season and the Marlins raved about how on a team with Giancarlo Stanton, Christian Yelich and Dee Gordon, among others, he emerged as the leader. The pop he showed in the first week, with a .909 slugging percentage, is gravy when it comes to a catcher who can start a season stacking four multi-hit games. The best part: Against the hard-throwing Nationals and Mets staffs, he went 21 at-bats without a strikeout before getting punched in the ninth inning Sunday by Addison Reed. 7. Yadier Molina. We at 10 Degrees headquarters wouldn’t dare do such a thing, lest our friends in St. Louis get the wrong idea. So instead of ruminating on the wisdom of rewarding a catcher with more than 14,000 innings of regular- and postseason wear and tear on his knees with a three-year, $60 million contract that doesn’t begin until after his 35th birthday, let’s instead talk about how someone on the Cardinals got caught no-handed with a foreign substance and what it means. First off, let’s all agree: This was hysterical. It’s like when you’re frantically searching for your sunglasses, tearing apart couch cushions and emptying cabinets, only to realize they’re on your head. Molina, and anyone with even a cursory knowledge of grip enhancements, understood what had happened. The rest of the world needed an explanation. Here’s the short-and-sweet version: Either Molina goops up his chest protector with pine tar or a rosin/sunscreen mixture, or pitcher Brett Cecil loaded the ball with one of the same. There is literally no other explanation. And in the modern game, where grip enhancements have become so ubiquitous Major League Baseball is trying to develop a ball with built-in tack to discourage pitchers from breaking the game’s foreign-substance rule every game, multiple times a game, it’s actually considered kosher. 8. Kendall Graveman becoming a one-pitch pitcher and looking damn near unhittable. If there is one regret from the offseason at 10 Degrees headquarters, it is not making Graveman the AL breakout pitcher of the year after hearing scouts and executives rave about him during the winter. More teams this winter asked about him than Sonny Gray, the A’s erstwhile ace. Even they’re surprised by Graveman throwing his sinker more than 90 percent of the time during the season’s first two games. With a little more oomph this season, no less, it’s an even more devastating pitch than last season, when Graveman threw it about two-thirds of the time. It’s so good, in fact, that between him and Franklin Barreto, who at 21 lit up Triple-A playing both shortstop and second this week, there is yet hope that the Josh Donaldson trade can be salvaged. Barreto could be the sort of star Oakland needs, and Graveman – at least the Graveman that neutered the Angels and Rangers – already is one. 9. Matt Harvey did early in the season, it makes these early weeks and months of the season, ones that don’t pack altogether that much resonance or importance, much more enjoyable. Baseball is better when Matt Harvey is good, and in that one start of his this season, he was pretty good. The fastball isn’t what it once was. He threw the slider a lot more and almost scrapped his curveball altogether, which is something worth keeping an eye on. As he readies for his next start against the Phillies on Tuesday, all eyes will be on Harvey sprinting from his past and writing his future. OK, now that the bad-joke portion of the proceedings is done, may we all come to the consensus on something: Tim Tebow playing baseball is a good thing. May we once and for all end the argument that Tebow is taking up the roster spot for a real baseball player? Players who get cut at low A do not make it. Period. Tebow is not preventing some future star from staying in the Mets organization. And let’s also acknowledge that because of his renown, his experiences, his having guided teams to actual, tangible, meaningful victories both college and professional, having Tebow around might be a good thing for the others with him. By all accounts, he has handled himself well enough, and while many in the Mets’ clubhouse saw him as an earnest puppet, his act plays with kids whose histories pale comparatively. That might not matter, but it might, too. Look, four dozen other guys in the minor leagues hit a pair of home runs this week, including the aforementioned Barreto, old friend Pedro Alvarez and a bunch of luminaries you’ve never heard of before and never will again. So ginning up excitement over Tim Tebow, ballplayer deluxe, isn’t just short-sighted. It’s disingenuous. It’s going to take far longer to know what Tim Tebow really can be, and almost everything is going against him. And that’s OK. Tebow is the same athlete he ever was, and though he failed at the last sport he believed he could play, this is another shot, another career, another opportunity to stay true and always believe, no matter how foolish it may seem. 0 Response to "Tim Tebow homers for second time in 3 games with Mets' Class A team"